But What Is 'A Shakeathon'? Fundamentally, I suppose, A Shakeathon, is simply LSW's celebration of the Bard's Birthday, which we choose to celebrate on the closest Sunday to Shakespeare's noted birth date, 23rd April. However, we must, of course, note that this date is not confirmed. We only know, for certain, that William Shakespeare was christened on 26th April. Still, it is a wonderful excuse to have a heady celebration of the language. For a further introduction of the ideas celebrated behind the Shakeathon, please refer to the picture by Robert Westfall to the right of this table. 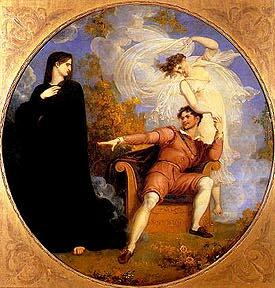 Westall depicts an uncharacteristically young and rakish Shakespeare flirting with Comedy, a light, wanton figure dressed in a revealingly diaphanous gown. Shakespeare holds the hand of Comedy, but he extends his other hand and bids Tragedy to stay. This is particularly apt for the idea behind the Shakeathon, as it is truly all encompassing. The handsomely roguish youth of Westfall's Shakespeare suggests a point in his career when he courted both muses, never totally abandoning Comedy, but soon to embrace Tragedy. Accordingly, the idea behind the LSW Shakeathon is that it too should be all embracing; a structure within which to be free. The Shakeathon is the brainchild of one man; a wonderful actor, Robert Langdon-Lloyd. This is his vision; one he originally christened 'Shakespeare Dreaming'. Robert was hailed for his work during what many consider one of the heydays of the RSC, during the sixties and early seventies. He has since gone on to do much work with Peter Brook, including the celebrated produciton of Mahabarata which toured throughout the world and which was filmed and is currently available on video. Even more recently, Robert has done sterling work with the Oxford Touring theatre, playing in Three Sisters, both throughout the U.K. and in the West End at the Whitehall Theatre and in Troilus and Cressida which was most recently seen at the celebrated Old Vic. Robert's simple, yet brilliant concept behind Shakespeare Dreaming, was that it should be as if Shakespeare had fallen asleep and this, the active interlude, would resemble the re-enactment of his Bardish dream. LSW is proud to be able to honour this, Mr. Langdon-Lloyd's burnished inspriation.